Review: "Alastis: The Other Side" - Sea of Tranquility - The Web Destination for Progressive Music! 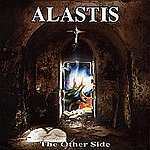 The Other Side, the third album from the venerable Swiss band Alastis, is that most rare of finds: a potent combination of aggression and melody, a worthwhile and memorable symphony of stories told in grand fashion. From the apocalyptic first track "In Darkness," it is clear that Alastis plans on subjecting you to a different kind of experience: a gothic, brooding, atmospheric combination of guitar and haunted-church keyboards. Forsaking sheer speed for crushing heaviness, The Other Side is successful largely because it is so unique. The only thing about the sound here that seems a bit out of place is the growling, plodding, guttural vocals, a European-twanged grrr that sounds like the vocalist was taking a very large, very painful dump while recording. But surprisingly, the singing works in a lot of places; these menacing tales of doom lend themselves to the vocals, and the whole thing flows together better than most. There are some truly great moments on this album; the title track stands out, as does the all-too-brief "Through The Chaos", a dazzling piece that is original and unpredictable. Even the low moments are adequately compensated for: the silly and disposable "Fight & Win" is followed by the brilliant, groundbreaking song "Slaves of Rot", a more mellow and restrained opus than it's name might imply. The Other Side has some major things in its favor from the get-go, most notably the fact that it was produced by Waldemar Sorychta, the man responsible for recordings by such bands as Tiamat, Grip Inc., and (drumroll please) The Gathering. The Gathering, as you may recall if you are a regular reader of Sea of Tranquility, is The Greatest Heavy Metal Band That Has Ever Existed, and very likely The Greatest Band That Has Ever Existed. In fact, I'm reminded of them a bit as I listen to The Other Side, and I realize that where Alastis could most stand to improve is in the area of vocals; Anneke (the vocalist of The Gathering) has the gift of being able to take ordinary words and pluck from them vocal melodies that no one else would ever dream of. Similar treatment, if applied to the solid and respectable songs written by Alastis, could make them immortal. But immortal or not, The Other Side is certainly one of the best heavy metal albums in a long time, a highly listenable and invigorating piece of sound.